Hello there! As we continue with Echo Park/Thermoweb Partner week I wanted to share my project with you. My favorite thing to do with layouts is add lots of dimension! Thermoweb has so many options to help with the layering process. Let me walk you through the many different adhesives I used on this layout to achieve more texture/dimension to my layout. I was given the Echo Park "Getaway" Collection. This collection is more of a travel/vacation themed package, but it has such awesome patterns it can be used for so much more. I knew it was perfect to showcase these sweet pictures between Doug and my sweet dog, Katie. Now.... how did I get all that dimension? Thermoweb XL Runner, 3D Zots, Foam Adhesive and Small Zots. Start by adding a few layers of paper onto the middle of the 12 x 12 base layer using your Themoweb XL Tape Runner. Apply the adhesive more toward the middle of the papers so the edges can lift freely. Cut photos down to size (Mine are roughly 3 x 3.5). Adhere the two outside photos flat using the XL runner, then use Thermoweb Foam Adhesive to "pop" the middle photo up slightly. 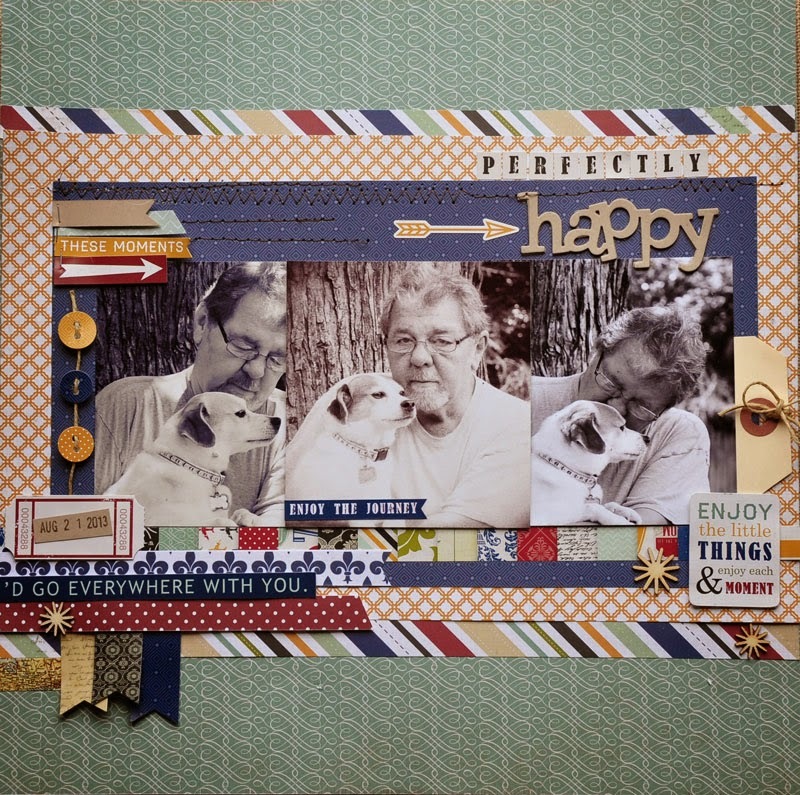 Continue adding strips of papers and embellishments from the Echo Park Getaway Collection using a variety of Thermoweb XL Runner, Foam Adhesive and 3D Zots for different dimensions throughout the layout. You can see on the photo below an example of the foam adhesive which was used under the pennant flags on the bottom of the layout as well as on the arrow banners above the photos. Adhere wood veneer pieces with Thermoweb small glue Zots. Finish the layout by adding small rows of sewing. Remember to try different adhesives throughout your layouts. Add foam adhesive to sticker sheets to make them "pop" off the page rather than lie flat, 3D Zots are your best friend, don't be afraid to use them. They are super strong and add lots of lift.